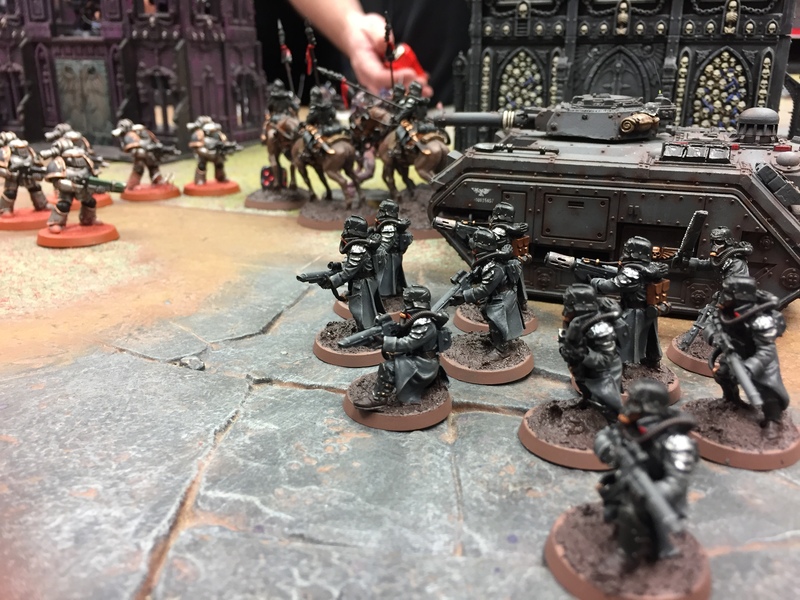 With the main bulk of the 308th regiment on parade duty back in the Krieg sector of Uhulis, several companies have been tasked with reinforcing the Cadian gate. Joining forces with the Crimson Fists they make the long warp journey to leave Segmentum Tempestus. As the fleet approaches the fringes of the Segmentum, it crosses through the Divan sector. 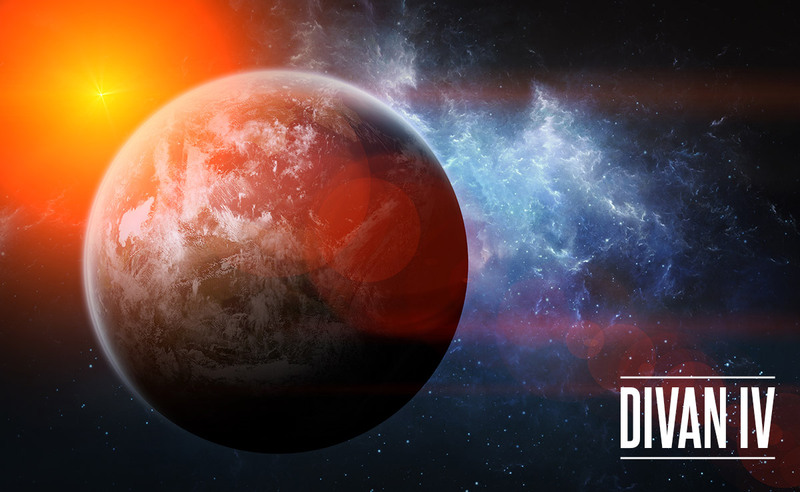 An astropathic communiqué from Divan IV requests their aid, forcing the fleet to drop out of the warp. On the surface of Divan IV, Brother Kleito, Captain of the 5th company of the Adeptus Astartes chapter the Doom Eagles, stumbled forward, clutching his precious dataslate, blood smearing the screen. It had been a dangerous mission to retrieve the data within. Now, surrounded by his fallen comrades, he knew it was all but a failure. His astropath made one last plea into the warp before a sonic blast tore most of his face off. The combined might of the Death Korps of Krieg and the Crimson Fists made planet fall, too late it seemed for Captain Kleito and his Doom Eagle brothers, whose bodies littered the battlefield. However, the corruption of Chaos was still all around them and would be cleansed. Commander Vanhar of the 108th would see to that and ensure the all important dataslate would be recovered. 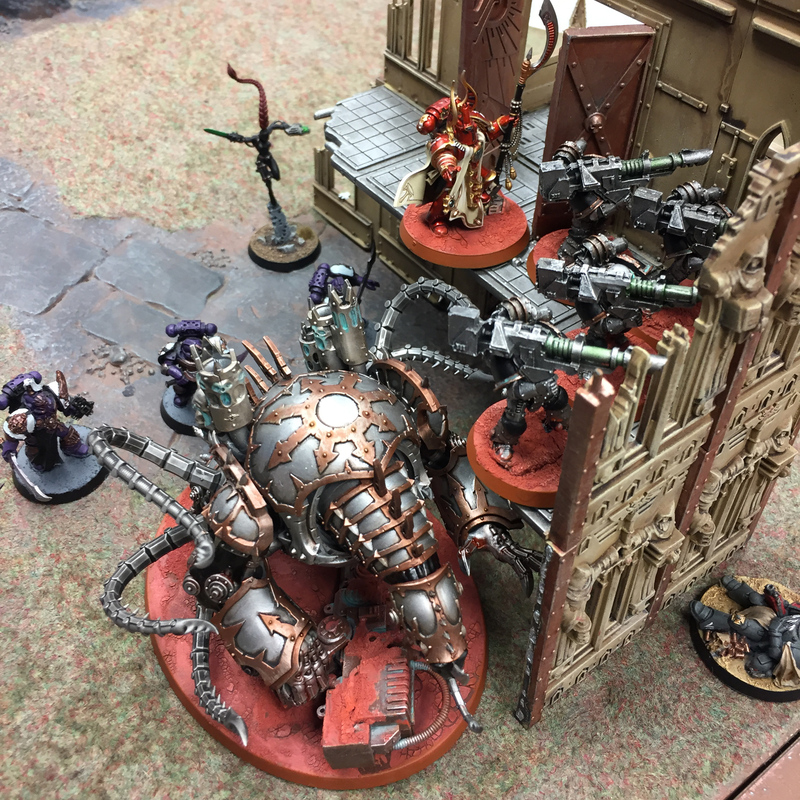 What remained of the Chaos attack were identified as Iron Warriors and Emperors Children. They had been in the sub-sector for some weeks now, a splinter force for the 13th Crusade, avoiding detection from the small Divan Battlefleet with ease. 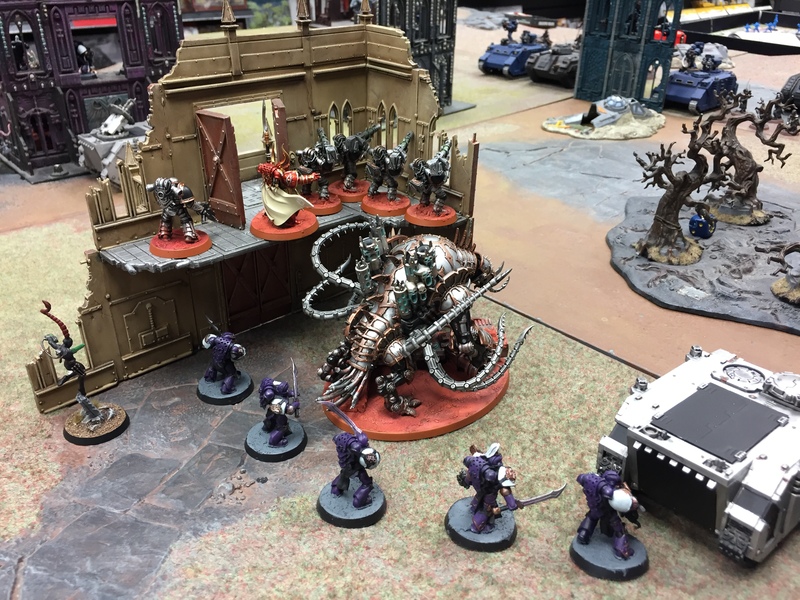 When the Doom Eagles strike cruiser had appeared in the sector and dispatched the 5th Company to Divan IV, they knew their opportunity to please their corrupt gods had arrived. Waiting for the strike cruiser to leave orbit, they attacked. 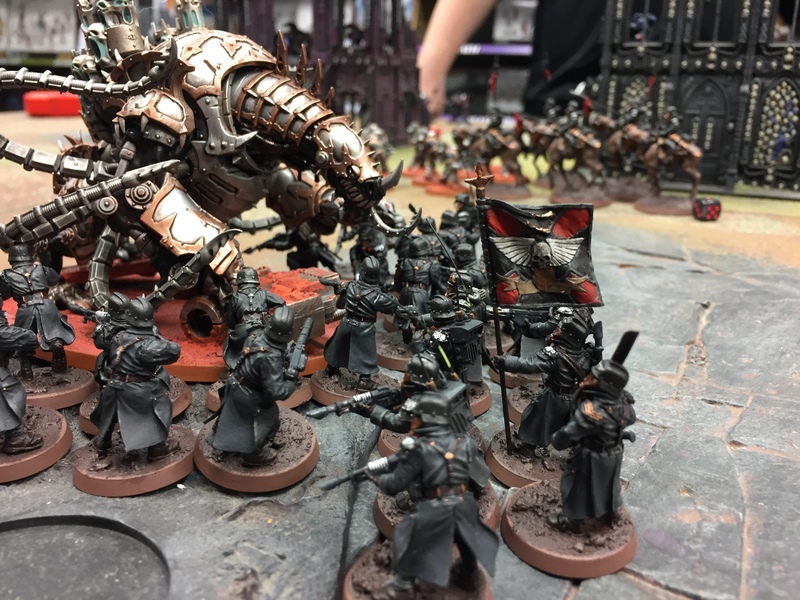 Flush with victory, the chaos hoard prowled the outskirts of the manufactorum, scouring the battlefield bodies for weapons, equipment and prisoners. Unbeknownst to them, the Doom Eagles’ precious dataslate was close by, still clutched in the hands of the dead captain. 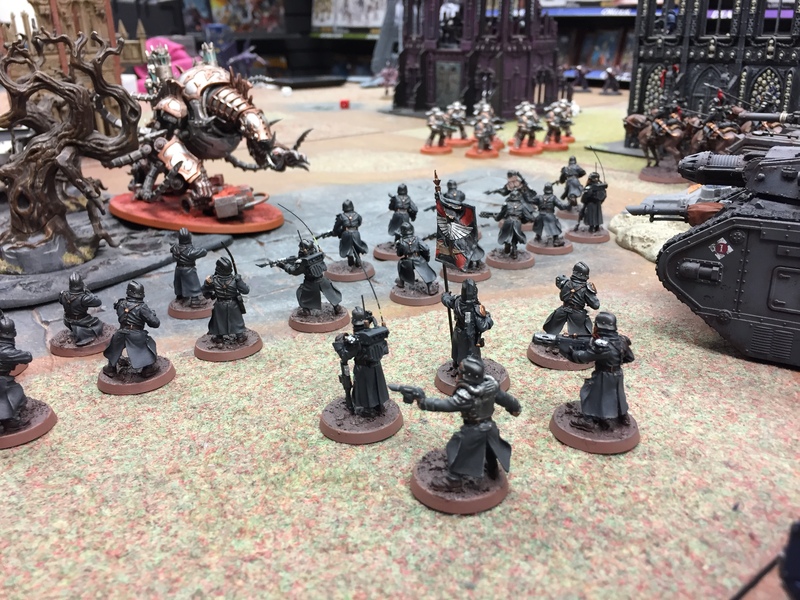 When the Imperial forces approached, the heretical adeptus astartes laid in wait, Sorcerer Moran-Kel marshalled his troops, setting up heavy weapon teams high amongst the ruins and readying the ground forces for attack. Moran-Kel bellowed out his orders. Behind him a squad of Emperors Children stood sentinel. One of these sons of the emperor shimmered and shifted, its shape morphing into that of a slender, synskin-clad Callidus Assassin. Before he even realised something was amiss, Sister Seianti’s phase sword slid into Moran-Kel’s neck, passing through his power armour as if it wasn’t there, his body crumbling into a heap on the floor. 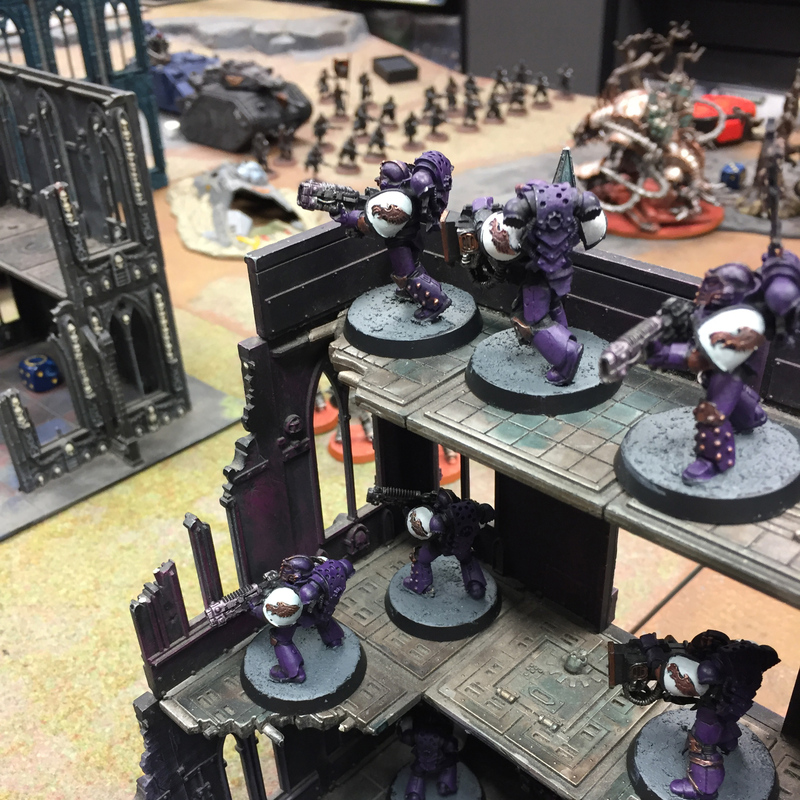 The Emperor’s Children turned on the intruder. Firing round after round but failing to find their target. 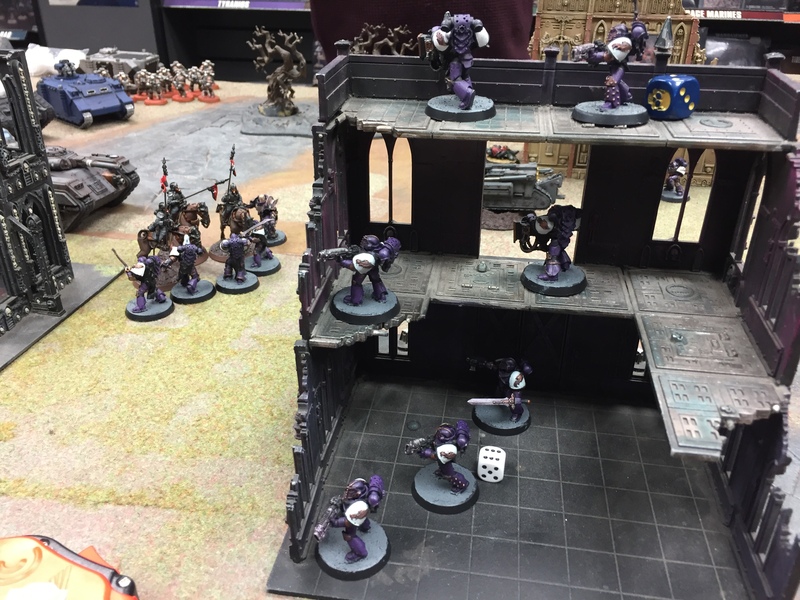 The noise marines of the Emperor’s Children let down a rain of sonic fury onto the oncoming Imperial forces. For every man that fell, ten more took his place, charging onwards towards the ruins of the manufactorum. 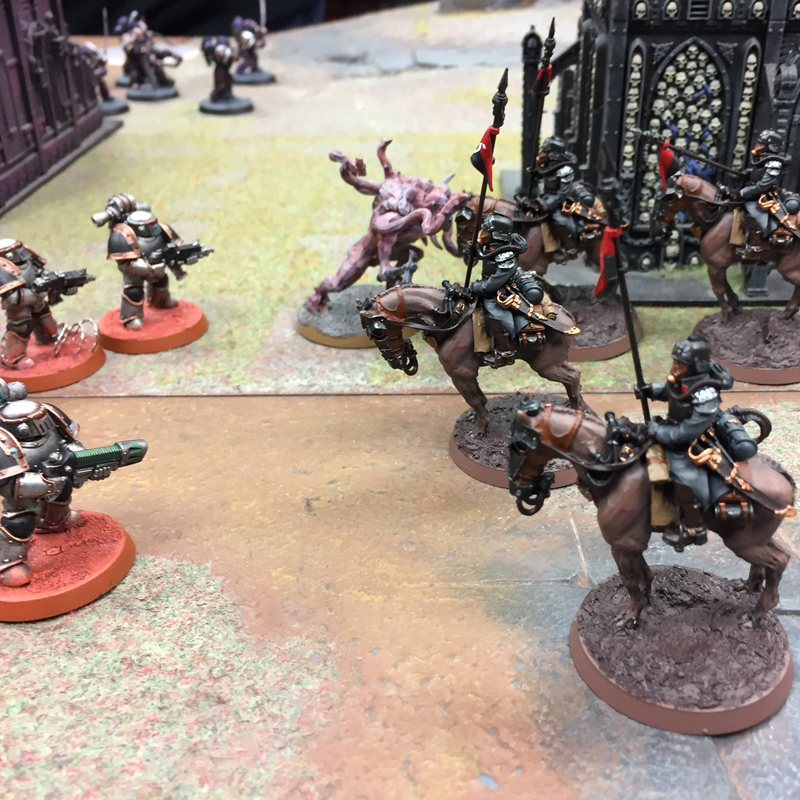 Daemon Engines crash through the ruins, charging towards the enemy with their mechanical tendrils whipping furiously around them. Man-sized monstrosities, who must have once been human prowl forwards with unnatural speed. Lunging onwards they shrug off las wounds as if they were nothing. 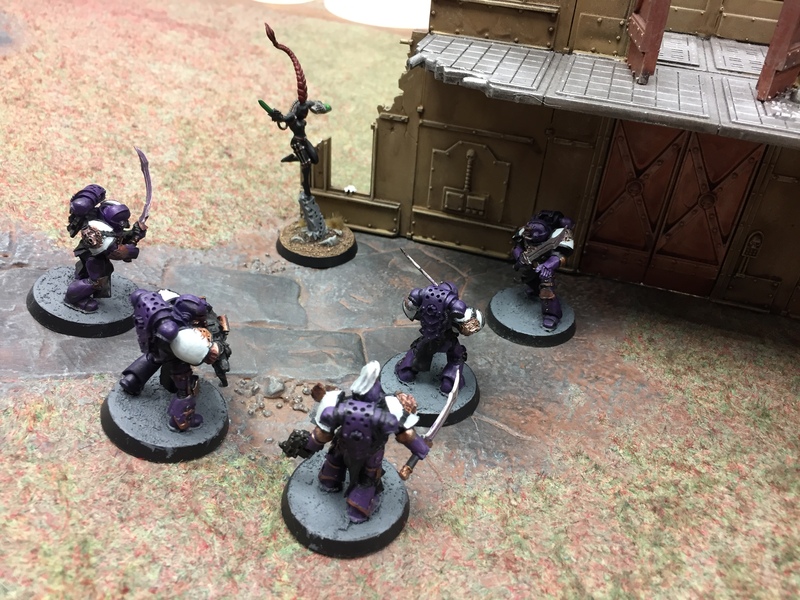 The Emperor’s Childen charge forth, cornering Sister Seianti amongst the ruins, her phase sword making short work of three of the marines before the sergeant’s power sword slices her abdomen. She stumbles to the floor, and before she has time to react, another sword comes down on her head. 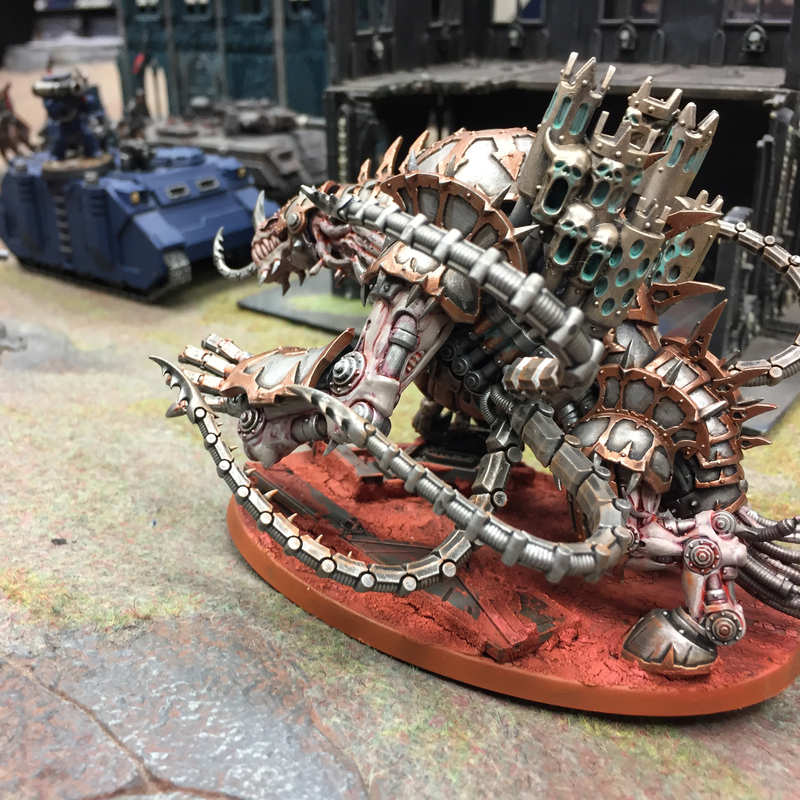 Fearless of the machine-beast, the Krieg charged forward towards it. Hoards of las blasts glanced from its armoured hull, while a krak grenade barely dented its plating. 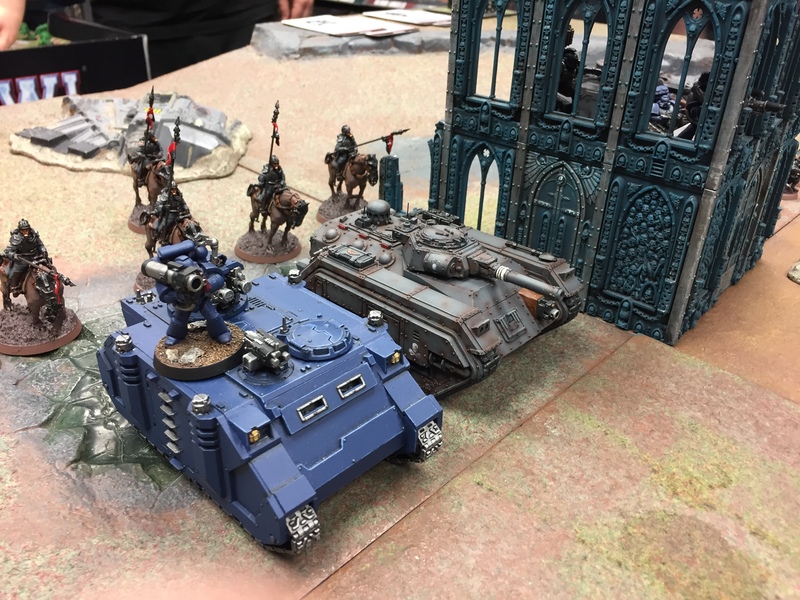 The Executioner tank rolled forth behind and took aim, it’s lascannon just missing, but the searing sun-burst of the plasma cannon tore into the beast’s carapace. Despite the molten hole in its shoulder, the monster acted as if nothing had happened. On it came, unstoppable, crashing towards the Krieg. A second maulerfiend crashed into the Crimson Fists line, tearing a squad of Assault Marines from limb to limb. 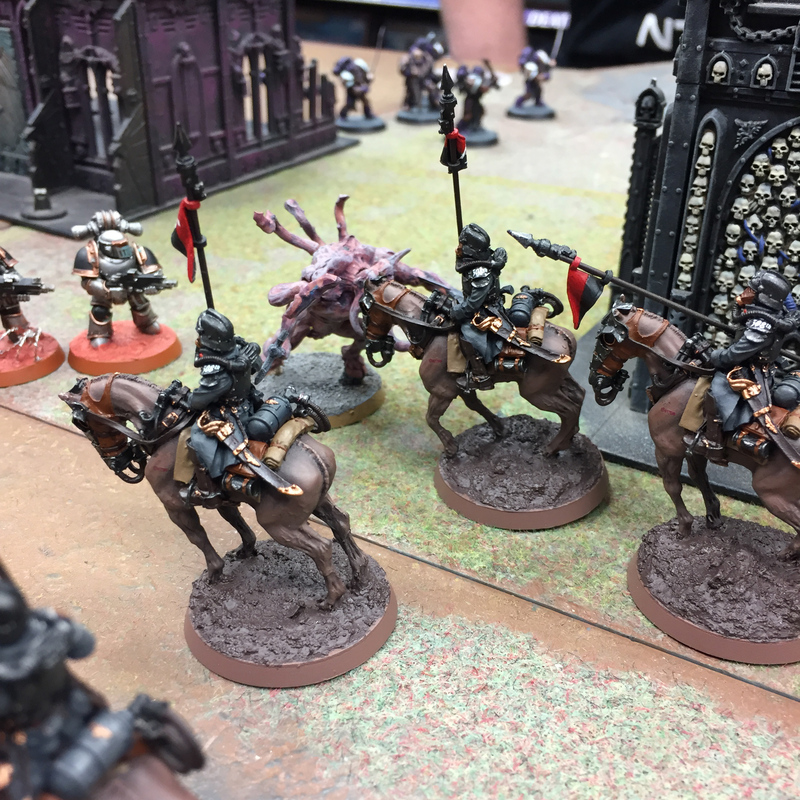 A squad of Iron Warriors advanced behind it, shooting into the Death Riders which were charging headlong into them. 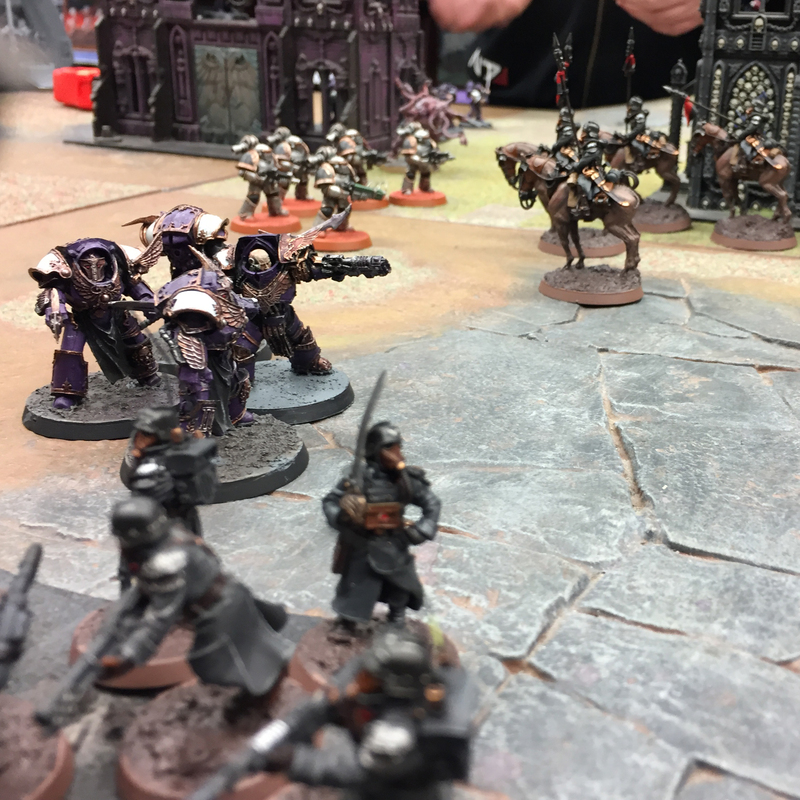 The Death Riders crashed into the Iron Warriors, the tips of their hunting lances exploding as they punctured the heretics’ power armour. 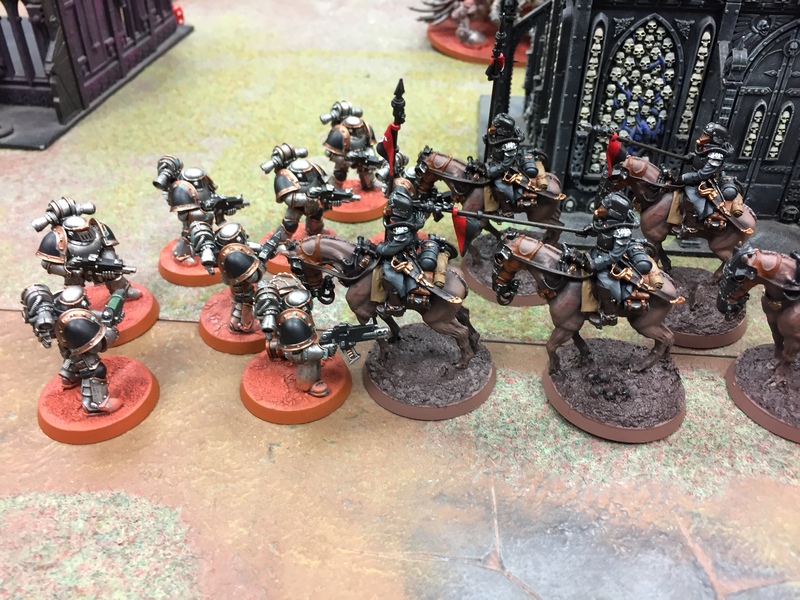 Half of the warriors were slain by the Death Riders and forced to retreat back from the charge. Commander Vanhar gave the order and a vox whistle signalled to the men to fix bayonets. A platoon, 25 strong, charged into the Divan beast. One solider was quickly crushed under its massive power claws; another flung across the wastes by its lasher tendrils. Vanhar activated the mag-lock plunger on his melta bomb and planted it directly on the belly of the beast. There was little time to react as the thermal charge detonated, ripping the daemon engine apart, causing a chain reaction within the beast. Its hell-reactor blowing apart, showering the platoon with shards of metal and warp flame. All told, 14 of his men had been killed in the ensuing explosion. A worthy tithe to the Emperor he knew, for that was the Krieg way. 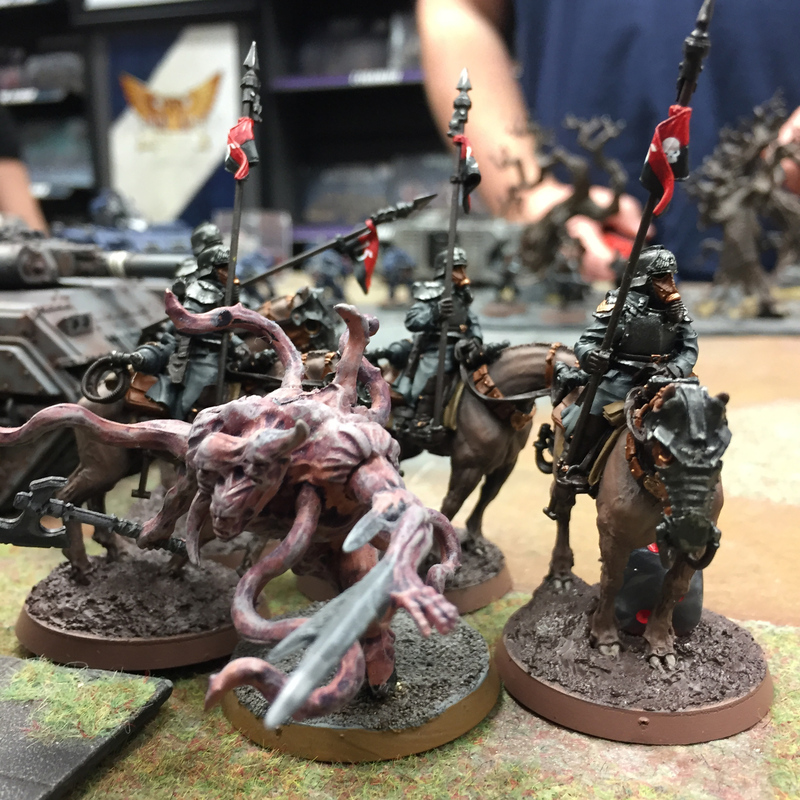 The foul beast crashes into the Death Riders flank. The riders draw their swords, clashing against claws and rusty weapon blades. The combat goes on for several minutes, the horses rounding on the beast and their riders hammering blows down upon it. The spawn, unable to land any blows, is soon felled by a sword to the head. Above Divan IV, the Chaos Strike Cruiser Harraticus laid in wait, teleporting down a squad of Emperor’s Children’s finest, clad in their ornate, tactical dreadnought armour. They immediately opened fire, laying waste to what remained of the Krieg Platoon. Commander Vanhar fell to the ground and rolled onto his back. Looking down, he saw a plasma blast had incinerated half his chest-plated carapace armour, along with half of his gut. Blood poured from his mouth, filling up his respirator, still he smiled, knowing at that at long last the Emperor had bestowed upon him the Penitent’s Blessing. The Imperials responded with a counter attack of their own. The Krieg’s Executioner Forward Command tank fired back. As it unleashed its volley, the plasma coils suddenly overheated under the stain, the venting chain-reaction blowing the tank’s turret, slaying the crew inside. Its final blast vapouring just one of the terminators. A squad of Imperial Fists’ finest returned fire on the unstoppable terminators. Their bolter rounds proved useless against them, not even denting their armour. Behind the enemy lines, the earth shook, swirling blades of death on tracks appeared from the earth, disgorging the might of the Krieg’s Engineer Sappers behind it. The Hades drill turned, its melta-cutter aiming down at the Emperor’s Children clad in their ancient armour. A swirl of molten magma burst from the small tank, vaporising the chaos squad in a split-second. 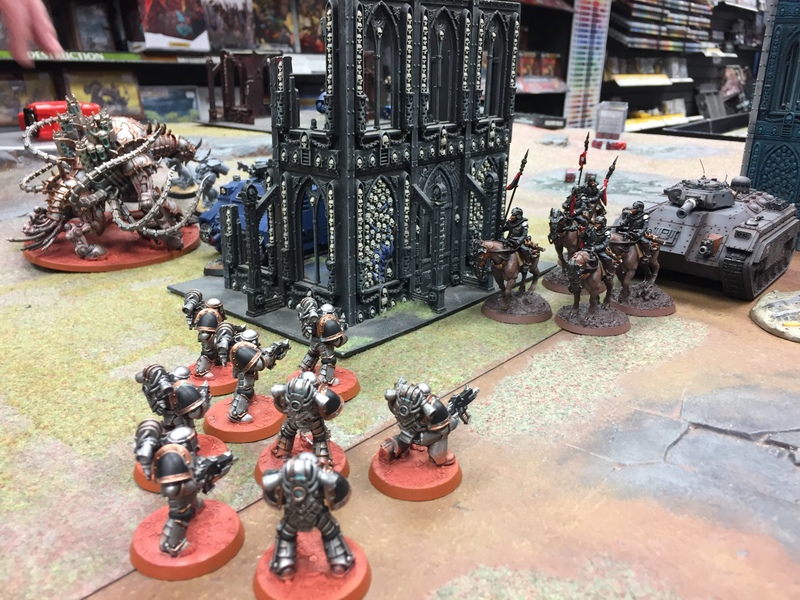 The Iron Warriors had rallied from the Death Rider charge and marched forwards once more. The Krieg responded, their Storm Chimera moving forwards disembarking its elite Grenadier unit inside. 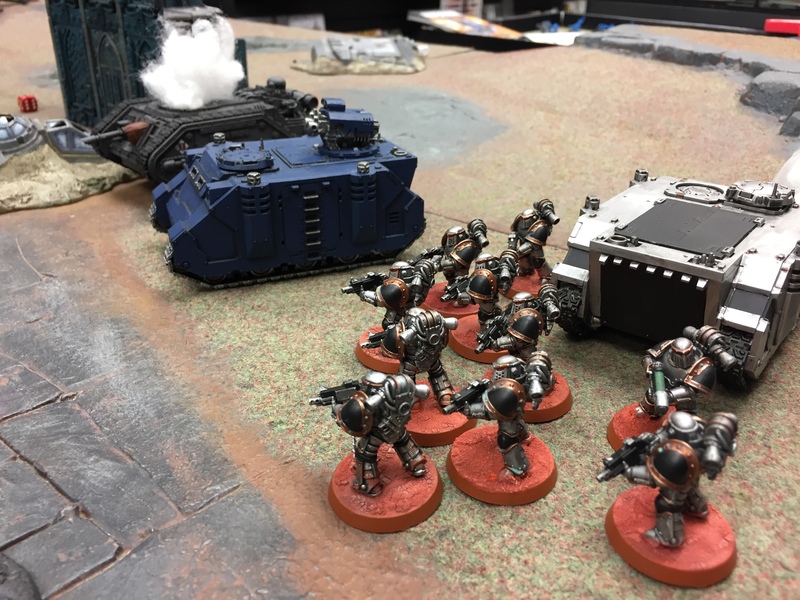 Hot-shot lasguns, with their overcharged las beams tore through power armour with ease killing several, while the specialist weapon gunners fired searing beams of melta downing another. 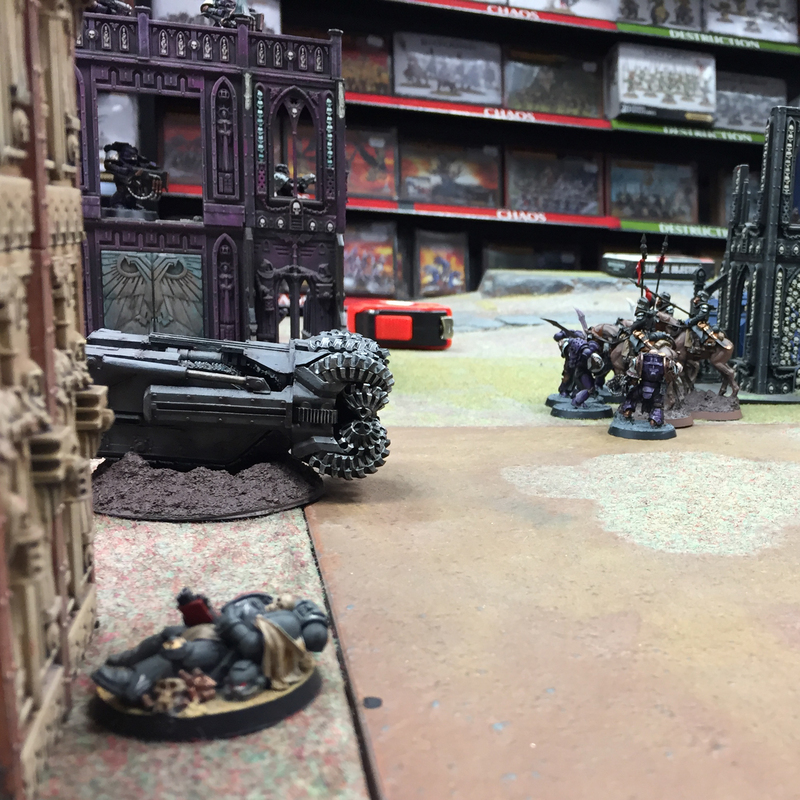 The sheer weight of firepower forced the Iron Warriors to fall back once more and cower from the Imperial might. The Noise Marines retaliated on behalf of their fleeing battle brothers. From their vantage point in the building, they hailed down sonic blasts into the defenceless Grenadiers. What little cover they had behind the Storm Chimera proved useless against these infernal sonic weapons: eardrums burst, eyes popped, brains boiled. The entire squad was obliterated in one quick volley. 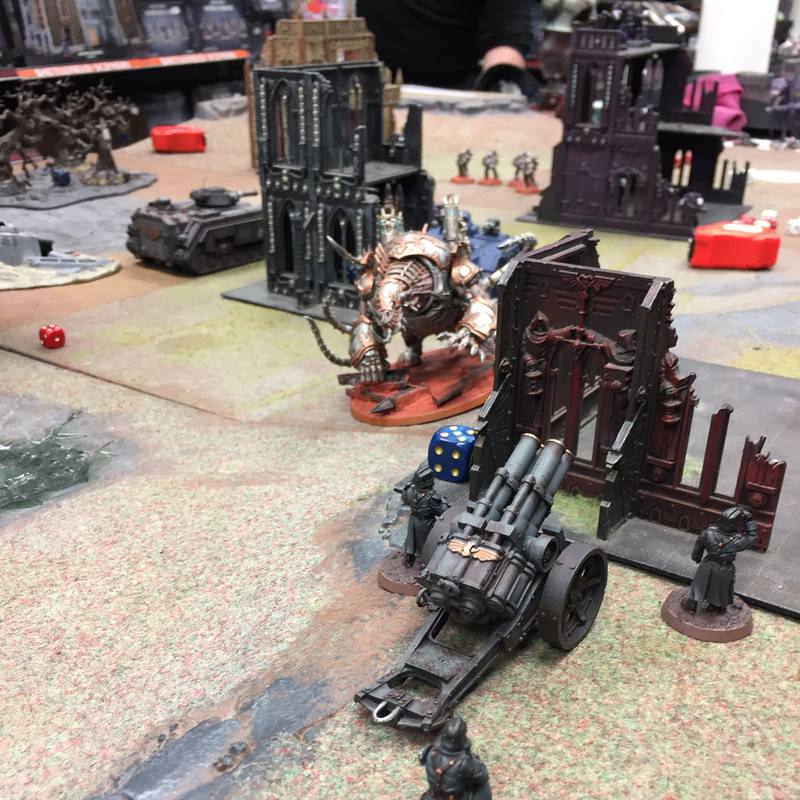 An outflank manoeuvre by a heretical Rhino transport saw an outpouring of Iron Warriors into the Crimson Fist’s rear. 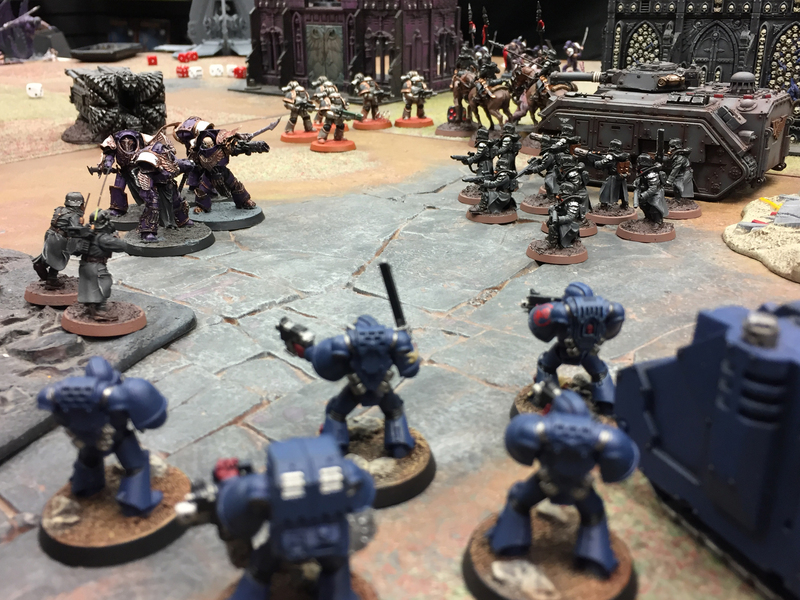 As the Fists moved to counter the fresh and unbloodied Iron Warriors rained bolter fire into the loyalist squad, leaving no man alive. 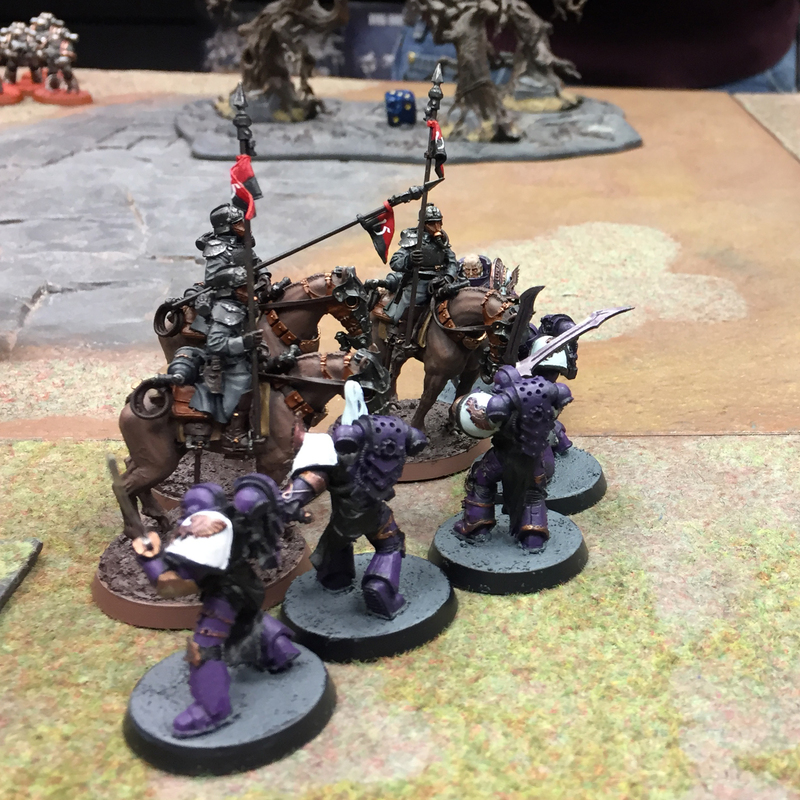 The final duel of Divan IV saw Captain Paeon of the Emperor’s Children charge into the battle weary Death Riders, whose sergeant met Paeon’s challenge with zeal. 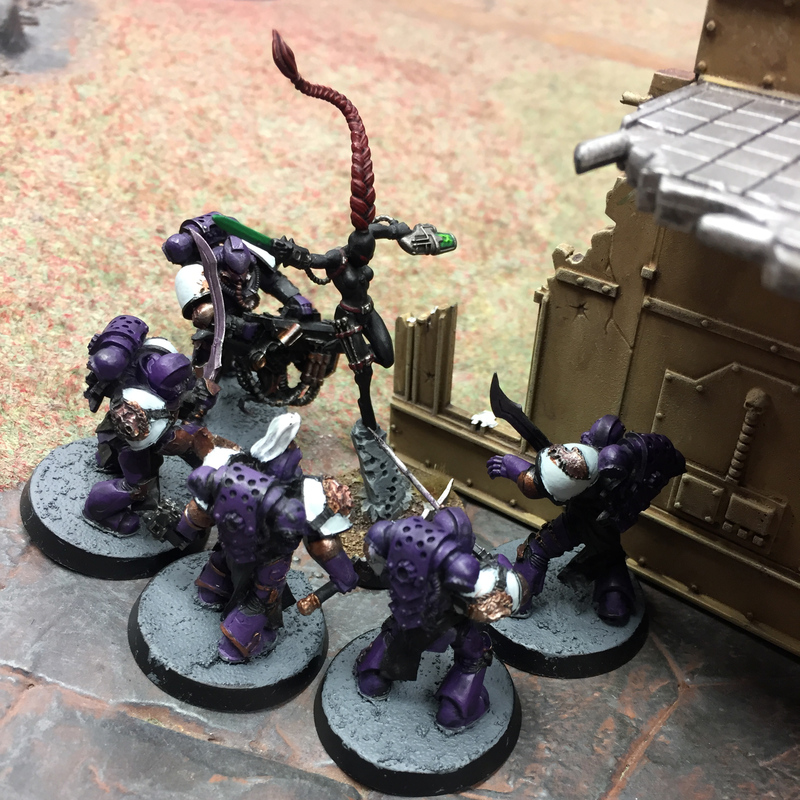 But alas, the sergeant was struck short, his death buying his squad the time it needed to strike back at Paeon’s own squad, cutting down one of his own. The combat, like the battle was a stalemate. The Krieg however hadn’t been able to secure the body of Brother Kleito, whose all important data-slate was now lost to the hands of Chaos. For the Imperium this was a mighty loss and a victory the nefarious Chaos would savour. Thanks for the feedback. Glad you liked it! They’ll be more on there way for sure. There’s a midway through my 3rd one over on https://www.instagram.com/beyondthetabletop/ which is where I initially post these. That’s a great battle report! 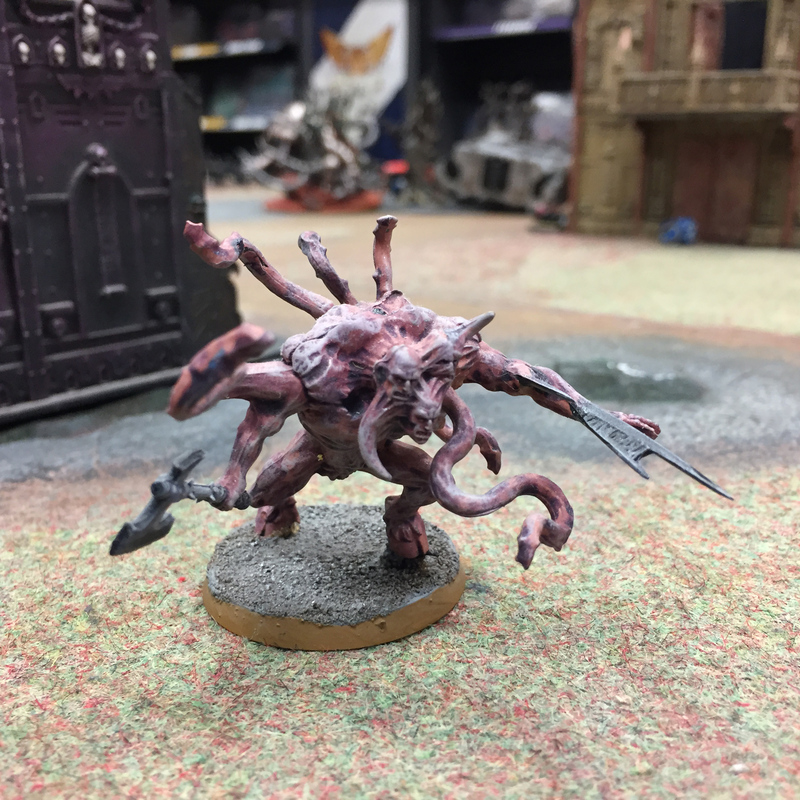 When you see a maulerfiend and fix bayonets, then your doing the right thing and are truly committed to the Krieg way, loved it! Glad you loved the write up, I’d love to do more in this style. For some reason I thought about the parade ground line recently and realised it was wrong. I might change it to the system or sub-sector instead as that’s more likely.